You are already in a state of worry and anxiety if you measure seasonal changes not by the change in the environment, but by the amount of hair you begin to lose. Seasonal hair loss, specifically during autumn and spring, is a natural response to seasonal changes and is reversible in most cases with simple hair loss remedies or care. In order to understand seasonal hair loss, it is important to understand how hair naturally grows and how much of hair loss is normal. A human scalp is home to more than one lakh hair follicles. A hair follicle provides anchorage for each hair on to the skin, and at the base of each hair follicle is a hair bulb. Blood vessels are connected to these hair bulbs which nourish them with all nutrition and supplements required for hair growth and structure. A hair follicle undergoes three phases in its life-cycle: growth, transition, and resting. Resting phase is the time when hair follicle rids itself of the supporting hair and becomes dormant for two to twelve months after which the cycle repeats. At any one time, 90-95% of the follicles are in the growth stage where they continually grow, while the remainder follicles are in the resting stage. The resting stage, between few weeks to a couple of months, primarily translates to a loss of 50 to 100 hairs every day, which is a normal condition. But hair loss in spring or autumn is more prominent as it is thought to extend the resting of the hair by greater degrees, therefore contributing to more hair falls per day than normal. Summer and spring is the time when you expose yourself to the sun more than ever in the entire year. More exposure to sun results in less production of melatonin by the body. Pineal gland produces melatonin, the synthesis and release of which is triggered by darkness. In addition to regulating sleep patterns, melatonin has antioxidant properties that helps regrow hair or slow down the rate of hair loss. Melatonin also has properties to heal damages made to hair follicles. 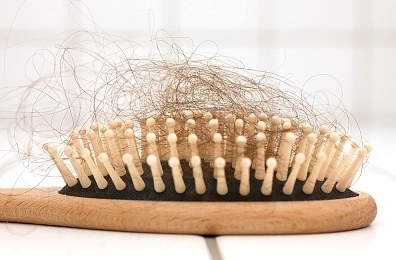 Less melatonin produced by body means hair follicles remain in their natural shedding state (resting phase) for more than usual amount of time resulting in more hair loss than usual. Testosterone often believed to be a male hormone exists in males and females alike. Seasonal hair loss is an effect of higher levels of production of testosterone by the body especially during spring and autumn seasons. Testosterone in the body is converted by an enzyme to DHT (dihydrotestosterone). Human hair follicles are sensitive to DHT, and when the body converts testosterone to DHT, the result is hair follicle shrinkage causing shorter and finer hair until eventually hair growth stops altogether. Some drugs are known to push more hairs from their growth stage to resting stage more rapidly. Some of the common drugs linked to bringing about this condition are: Retanoids used for acne treatment, beta-blockers, anti-depressants, anti-coagulants and some non-steroidal drugs. Stress is the most common and the most rigorous enemy of hair. Stress of course is not dictated by any one particular season, but the effect of stress during or just before spring or autumn is worse for the hair and results in more hair loss than usual. More stress during these seasons causes body to push its immune system to overdrive, which can lead the system’s self-defense agency, the white blood cells, to attack the body’s own hair follicles. Weakening of hair follicles results in increased loss of hair. Practicing yoga, exercise and good sleeping patterns to reverse stress. This can prove out to be one of the best hair fall treatment. Increasing iron content in the diet if your body shows iron deficiency. Meeting your bodily iron requirements can promote growth. Rich food sources of iron are green leafy vegetables like spinach, red meat, egg yolks. Taking doctor prescribed melatonin drugs, that can be taken orally or through injection, to supplement melatonin insufficiency during summer or autumn. As suggested before, seasonal hair loss is a natural bodily phenomenon and doesn’t need to be worried about. If, however, you are experiencing extreme hair thinning or loss during spring or autumn or any other season, or you suspect you notice more hair falls than previous years, consulting your doctor is strongly recommended, for there may be other underlying hair fall condition you may not be aware of. Keep your body healthy. Body health translates into scalp health and allows follicles to continue to produce hair to replace that which is lost. Good diet and exercise, to increase blood circulation are really important. Use topical treatments for your scalp. Essential oils and combinations of herbs can be very helpful in keeping follicles open and productive. Hair loss is caused due to many reasons such as lack of vitamins, minerals or iron in the body, age, pollution, heredity, stress, lack of sleep, hormonal imbalance and illness. It is said that losing about 100 hairs a day is normal. If you lose more hair then it’s an alarming sign. Keep your hair clean. It will prevent dandruff, itching and hair lice, which ultimately result in hair fall. Make a mixture at home of amla, shikakai and dry neem leaves, apply on scalp and leave it on for an hour before washing. · Eat a healthy diet including green vegetables, dairy products and fruits. · Drink coconut water to prevent hair fall. · Include at least 2 nuts in your daily diet to help strengthen hair. · Avoid using harsh clips or bands and do not tie your hair up tightly. · Protect the hair from dust and sun. Cover your head while going out in direct sunlight. · Eat iron-rich fruits and food helps in preventing hair fall. Include apples, beetroot and jaggery in your diet. They are rich in iron and so help prevent hair fall. please increase your intake of nuts like walnuts that promote scalp health and stop hair fall. also increase your intake of whole grains and "dal" that are rich in vitamin b9 or folic acid. it aids in renewing hair cells, leading to healthy hair.